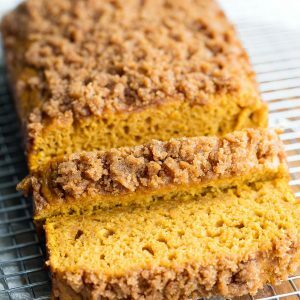 This Pumpkin Bread with Cinnamon Sugar Streusel has a quick and easy trick for making canned pumpkin taste AWESOME! 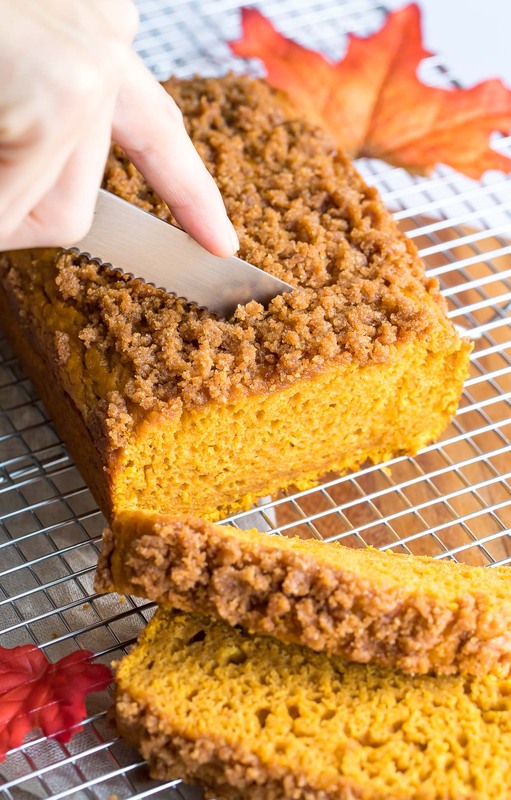 This is hands-down our favorite fluffy pumpkin bread recipe ever. My 5-year-old and I have been straight up fangirling over this pumpkin bread. Banana bread is usually our go-to but ever since this bad boy came into our lives it is all about the pumpkin! We’re on our third loaf right now and I couldn’t wait a moment longer to hop on here and write the recipe up so y’all can join us in our obsession. There’s an extra step that totally makes this bread, I wouldn’t dream of skipping it ever! A quick little sauté of the canned pumpkin adds a full-bodied nuttiness to the pumpkin and completely transforms it. Even better? We can totally make our pumpkin bread right in the pot! It’s almost like we’re making luscious pumpkin butter for the base of our pumpkin bread. Another thing I swear by is using scale measurements for my flour and sugar. I have a cute mini kitchen scale (this one) that I’ve been using for several years now. Instead of carefully spooning and scraping flour into a measuring cup, I just plop a small measuring bowl on my scale and fill it up! I find that my results are way more accurate and I’m not making half the mess I normally do. 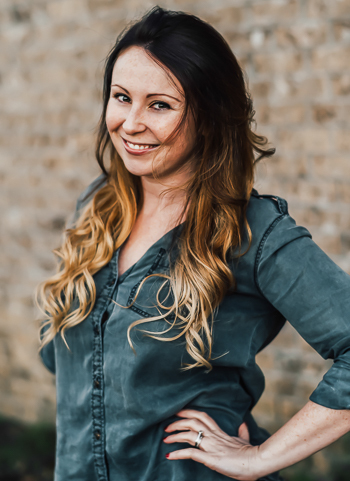 Measuring flour and sugar by weight has been a total game changer for me and I can’t recommend it enough! Lastly, I like adding the streusel at the halfway point during baking and rotating the pan. This way the bread cooks evenly and the streusel perfectly golden and crumbly, without melting or over-browning. I’ve tried it a few ways and this is by far my favorite. Ready to make some pumpkin bread? Adjust oven rack to the center position and preheat oven to 350 degrees F. Grease a 9 by 5-inch loaf pan. Whisk together flour, baking powder, and baking soda in a bowl and set aside. For best results, measure flour by weight or use the spoon and sweep method for your flour. Heat a medium-large pot to medium heat (my dial was at 6) and add your oil. One heated, add your pumpkin, salt, cinnamon, nutmeg, and pumpkin pie spice blend. Cook, stirring constantly, for approx. 6-8 minutes. Remove pot from heat and add granulated sugar, brown sugar, and cream cheese. Stir and allow to cool for 5 minutes, then whisk well until ingredients are completely incorporated. In a small bowl whisk together milk and eggs, then add to the pumpkin. Gently fold in flour mixture until combined (some small lumps are totally okay) and pour into prepared loaf pan. Bake for 30-35 minutes, adding streusel topping and rotating the pan at the 15 minute mark. Simply set a timer and you're good to go! To make the streusel, use fingers to mix all ingredients together in a bowl until texture resembles crumbly wet sand. At the 30 minute mark, test with a toothpick for doneness. A toothpick inserted to the center of the loaf will come out clean when the bread is cooked through. Allow to cool in pan for 20 minutes, then remove bread and let it finish cooling on a wire rack. Enjoy! For a lighter topping, simply cut the streusel recipe in half. Love walnuts in your quick bread? They're fantastic here! Simply fold in 1/2 cup finely chopped walnuts into the batter after mixing. This recipe uses approx. 1/2 a can of pumpkin puree. Want to use up the whole can? Fantastic! 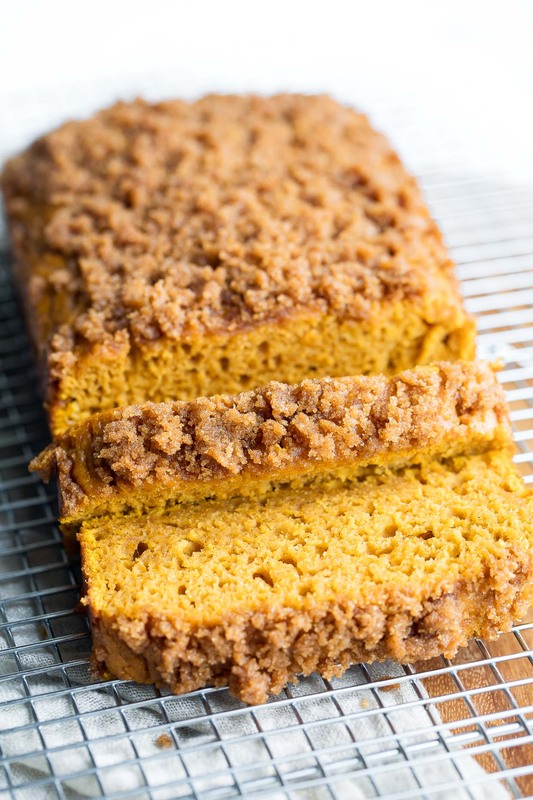 See the blog post below for a doubled recipe that makes 2 loaves of pumpkin streusel bread. Freeze one for later or gift to a friend! Using an 8.5 by 4.5 loaf pan instead? Simply increase bake time to 45-50 minutes. Recipe adapted from America’s Test Kitchen New Family Cookbook (affiliate) <– we are bonkers for this cookbook! If you get a chance to try this tasty recipe, let me know! Leave some love in the comment form below or tag your photos with @peasandcrayons on Instagram so I can happy dance over your creation! Spooky Snacks and Healthy Halloween Treats! Is there something I can use instead of cream cheese to make it dairy-free (I already have subs for the milk and butter)? It looks so yummy! Hi Mandy! I’ve made this bread several times but not with these particular swaps so I can’t really advise with certainty. It will be a new recipe with the non-dairy ingredients but still may work if you’d like to experiment! Hmm… What about trying my Pumpkin Spice Streusel Muffins recipe? You could bake them into a loaf if preferred (just use loaf baking times based on what you’re using) and they’re dairy-free aside from the streusel which can typically be made with a little coconut oil in place of the butter! Unbelievably delicious! The bread was a perfect balance of soft and light. My entire family loved it. The topping was amazing!! Super stoked you all loved the bread! I legit can’t stop making it and my 5 year old straight up BEGS! We ran out of pumpkin this past week and I thought she was going to have a meltdown, lol. 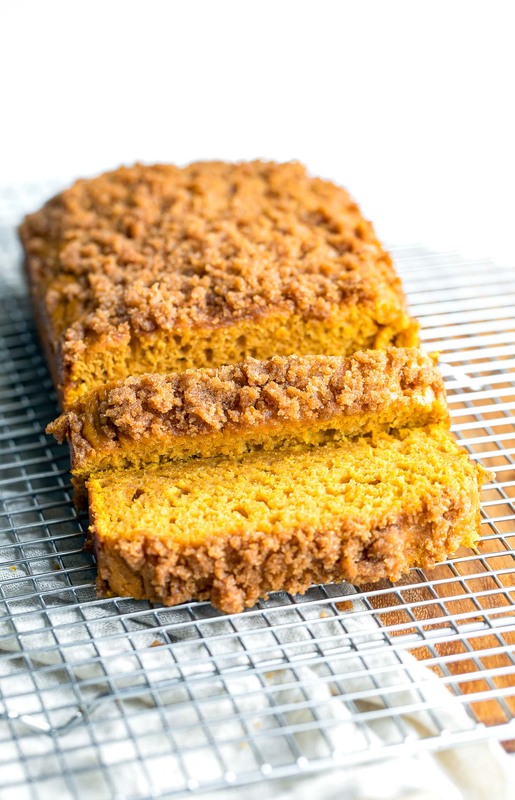 I’m already a pumpkin baked goods fanatic, and the addition of the streusel to the top sends this recipe over the top for me! So yummy! Thanks Maggie! The streusel is so dreamy right?! Love it so! This bread was amazing! So fluffy and tasted just like pumpkin. Woot! So glad you enjoyed it Tatiana, thank you! Couldn’t find how to double this. It was so good! Would you just double each ingredient? Put mixture in mini loaf pans.used same cookomg time. Eek! Did they seem overdone at the same bake time/temp as the large loaf? Any other changes or swaps to the recipe? The bread should for sure be sponge-y, soft, and only slightly dense from the pumpkin; almost like a moist banana bread but in pumpkin form. Can vegetable oil be used instead of avocado/coconut oil? Bread that eats like dessert! The fam is totally obsessed. This recipe is moist with all the crunchy goodness on top. Perfect fall treat; recipe is a keeper. Total dessert bread status up in here! Thank you Kristin!